otherwise O/R 24 HR in advance. In case of arrivals/departures outside of the Schengen Area 48 HR O/R SAT, SUN, HOL. Customs and immigration clearance: Customs clearance: On written request 24 HR in advance. Immigration clearance: On written request 24 HR in advance, 48 HR in advance in case of SAT, SUN, HOL. 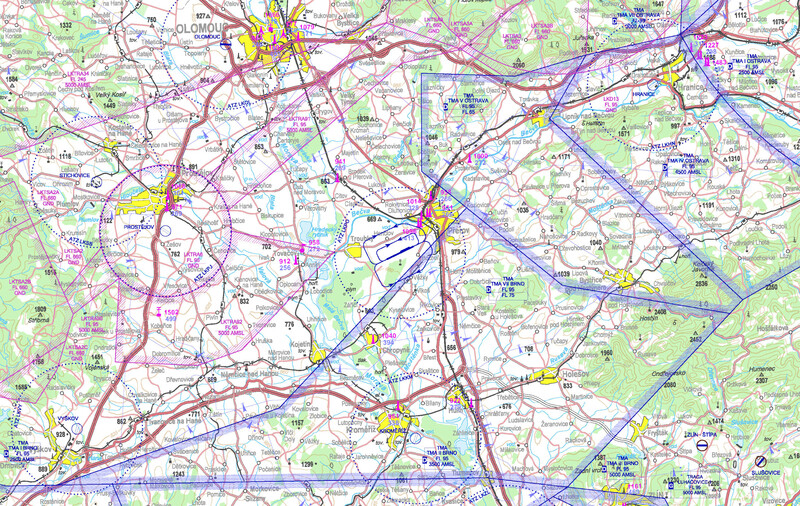 With exception of take offs and landings minimum altitude for flights in all area of ATZ Prerov is 1640 ft / 500 m AMSL. The flights over town Prerov are possible only in exceptional cases at minimum altitude 2400 ft / 730 m AMSL. Parallel operation (simultaneous take-off or landing) on RWY 06/24 (concrete) and RWY 05/23 (grass) is not allowed. 1.1Aerodrome Prerov (LKPO) is international private aerodrome and domestic public aerodrome. For arrivals, departures and local flights outside operational hours written permission from the aerodrome operator shall be obtained. International flight by letter request 24 HR in advance (in and outside operating hours). In case of arrivals and departures outside of the Schengen Area during SAT, SUN, HOL, a letter request shall be sent 48 HR in advance. The written requests for permission shall be sent at provoz.lkpo@lompraha.cz 24 HR in advance (See: http://www.prerov-airport.cz). 1.2Snow clearance of movement area is provided in limited extent on request. 1.3With exception of take offs and landings minimum altitude for flights in all area of ATZ Prerov is 1640 ft / 500 m AMSL. 1.4The flights over town Prerov are possible only in exceptional cases at minimum altitude 2400 ft / 730 m AMSL. Parallel take-off is allowed from H1 and H3 heliports or H1, H2 and H3 separately. Traffic on RWY 06/24, 05/23 and on H is independant with regard to helicopter traffic. TWY B shall be used while heliports 1-3 are in use with regard to helicopter traffic. 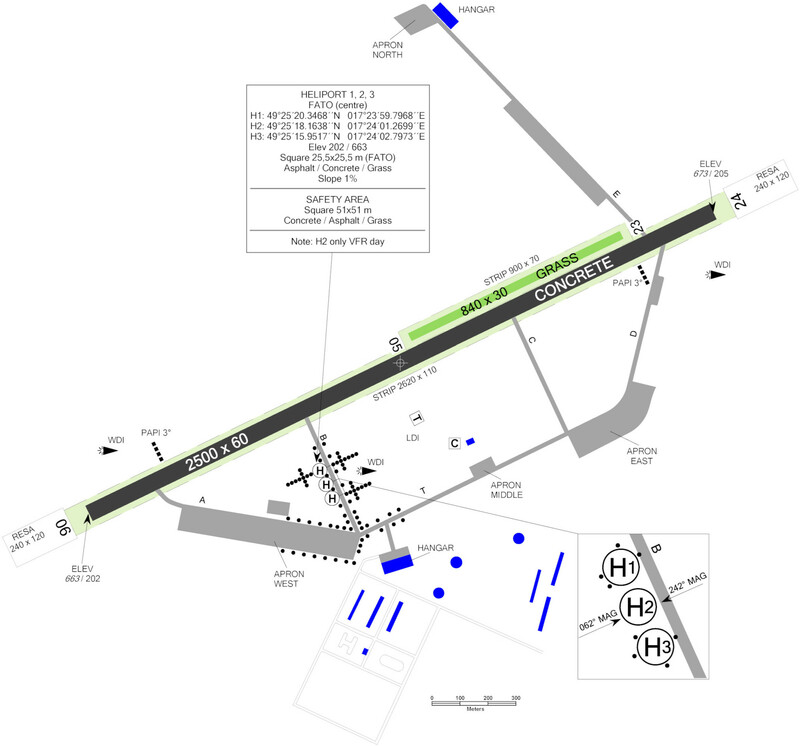 1.5.3Arrival and entry to the traffic circuit carry out via tangent line in altitude stated by the unit Providing information to known traffic. If the flight altitude is lower than the traffic circuit altitude arrival in lower altitude or direct approach can be carried out but only with an approval of the unit Providing information to known traffic. 1.5.4Fire category increase O/R 24 HR in advance during AD operating hours, 48 HR in advance during SAT, SUN, HOL. 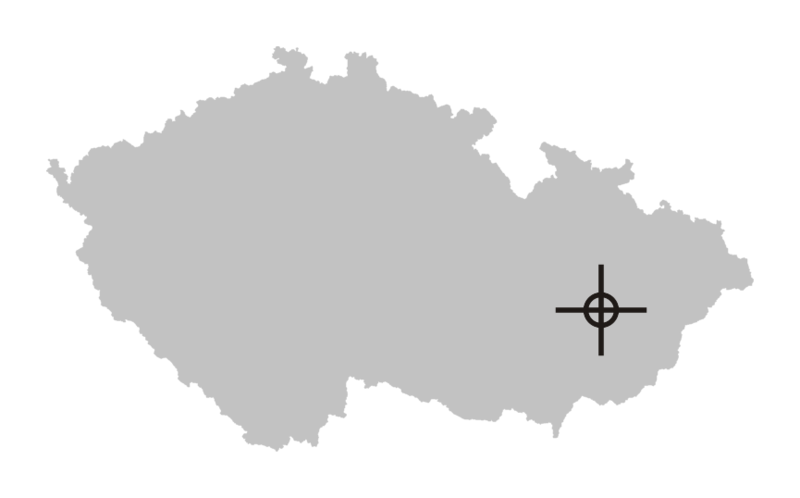 Providing information to known traffic in Czech and English language. Handling on request. One-time charge is a charge for 1 landing at LKPO (applies to concrete and grass). The charge depends on the type and the tonnage of an aircraft. The aforementioned charges for parking on APRON are valid only for parking up to 3 days. The price of long-term parking will be determined based on contract. Other services are listed in valid price list on the website http://www.prerov-airport.cz/index.php?id=122. In case the aircraft operator does not pay landing and other charges in time and right amount, the aircraft operator shall pay to aerodrome operator a contractual fine amounting 0,05 % of the amount payable per each day (including day initiated).